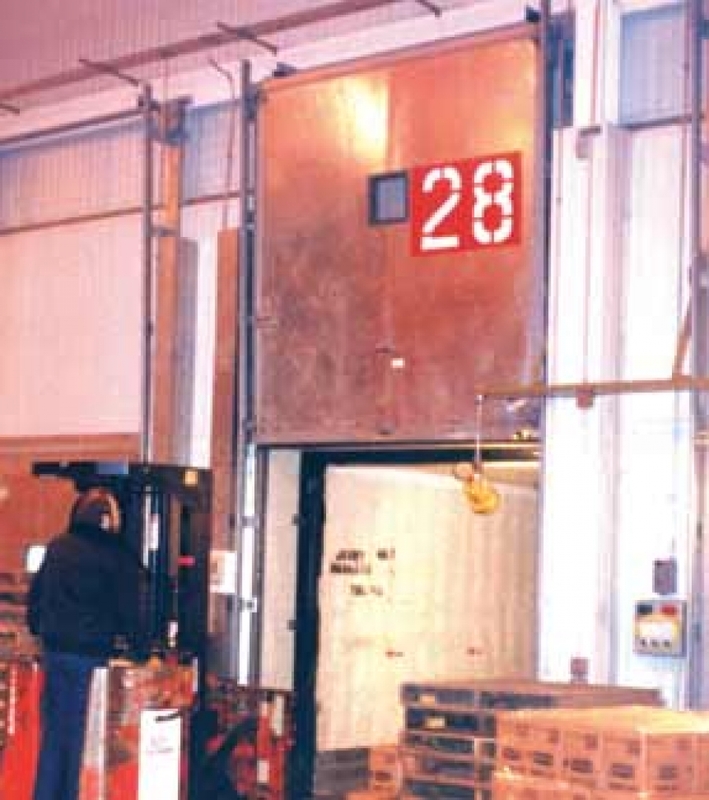 Single Piece Vertical Rise Metal Cooler/Freezer Door | Dock Door Systems Inc. Ideal for areas with side clearance restrictions. Unitized high strength galvanized steel panel with pour type polyurethane insulated core and 20 ga. galvanized steel finish. Available in 24 ga. embossed white stucco,20 ga. stainless steel, or other colored metals. USDA approved. Internal steel mounting plates for solid hardware anchoring. Adjustable “down and in” panel action provides positive seal and reduces gasket wear. Synthetic grease-resistant fully adjustable gaskets at four sides for positive seal. Adjustable counter balancing weight system which eliminates costly torsion springs. Heavy-duty hardware. 16 ga. formed galvanized steel capping with cast “Almag” corners. Instant reversing edge along full width and travel of door. Freezer door provided with "No Frost" heater cable system. Power Models also include:Standard electro-mechanical operation for speed andlong life (18” per second). Optional hydraulic operation (25” per second). Other sizes available - consult factory. Unitized high strength galvanized steel panel with pour-type polyurethane insulated core and 20 ga. galvanized steel finish. USDA approved. 16 ga. formed galvanized steel capping with cast “Almag” corners. Galvanized steel vertical casings.Full perimeter gaskets. 4" or 6" poured polyurethane foam. "K" factor of .12 at 75°F. High output hydraulic pump driven by totally enclosed electric motor. Low speed, high torque hydraulic motor. NEMA-4 rated fiberglass control box. Adjustable cast iron stack weights; extra weights furnished. 3/16" aircraft cable w/adjustable turnbuckle. 24 ga. embossed white stucco or 20 ga. stainless steel finish. Other colored metals (consult factory). Kickplates on door and frame. Extra pull cord or single push button actuators (2-pull cord standard). Slide bolt locking (one or both sides). Window 12" x 12", 2 or 3 lite, heated or unheated. 1 year limited warranty on parts and labor.